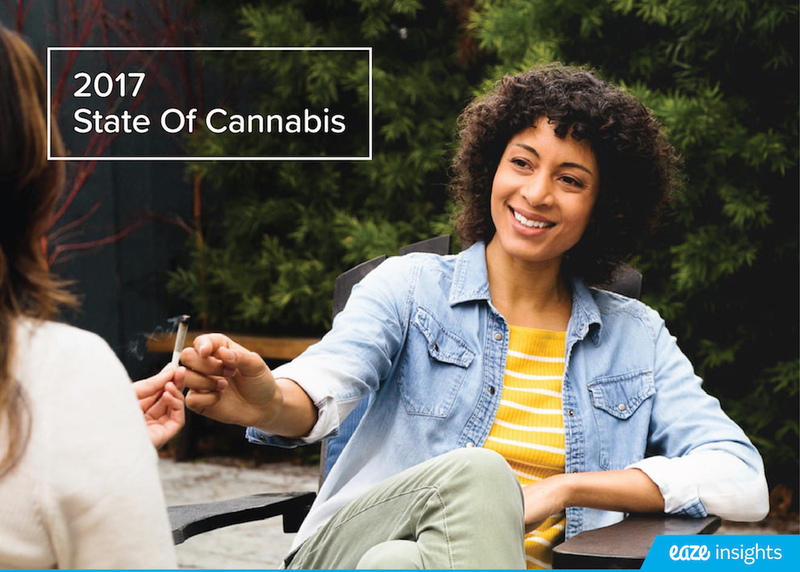 This annual report covers the current trends in the California cannabis market, what happened in 2017, and what to expect for 2018. 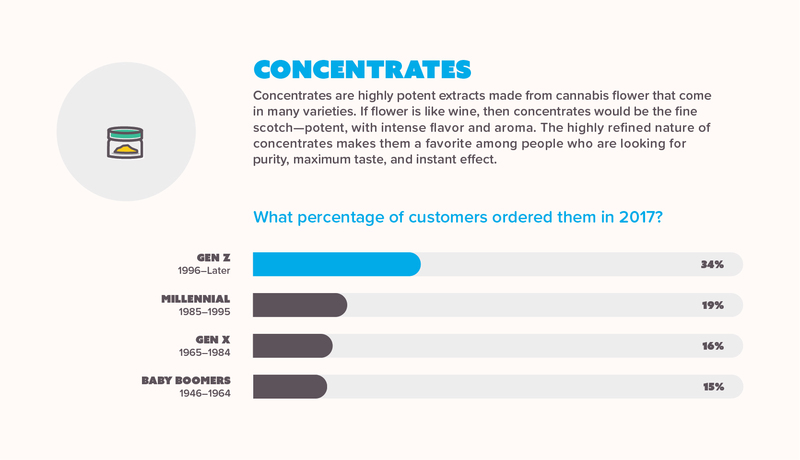 The following report looks at the anonymized consumer behavior data from Eaze's database of 350,000 cannabis consumers as well as attitudes and usage data based on over 15,000 survey respondents. On November 8, 2016, California voted to end prohibition and legalized marijuana for adult use. The very next day, marijuana demand increased by 18% as people traded old social stigmas for curious new experiences. The people were reassured by marijuana's new and lawful status, and thus the era of legal marijuana arrived in California. Every day more people are discovering marijuana as a wellness tool, many for the first time ever. 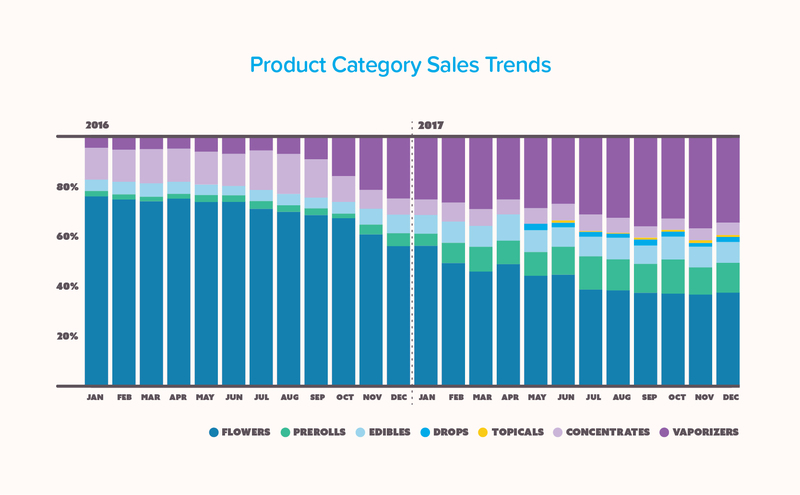 Eaze's industry-leading data indicates a very promising forecast for California's cannabis industry. Californians are increasingly comfortable with marijuana use and are embracing its benefits. 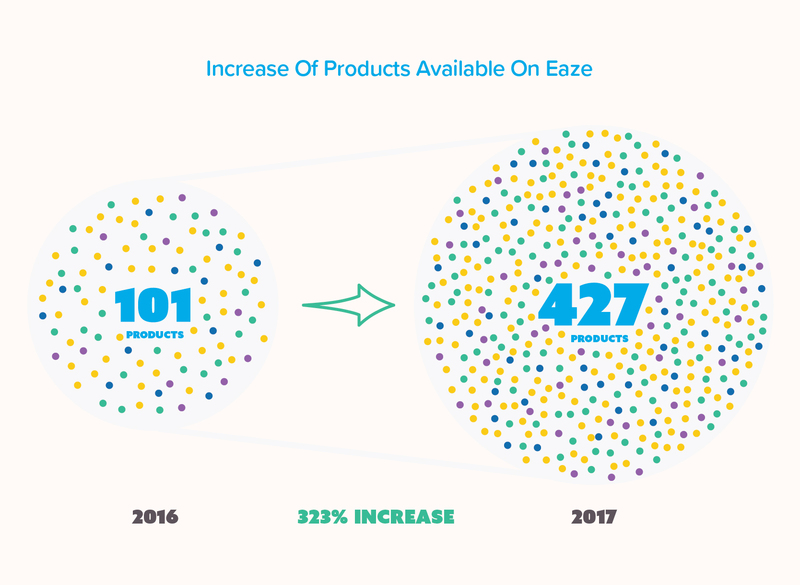 On a typical day in 2016, Eaze customers placed an order every 30 seconds. In 2017, that number increased 200%, resulting in an order every 10 seconds. The cannabis industry is thriving in the Golden State. 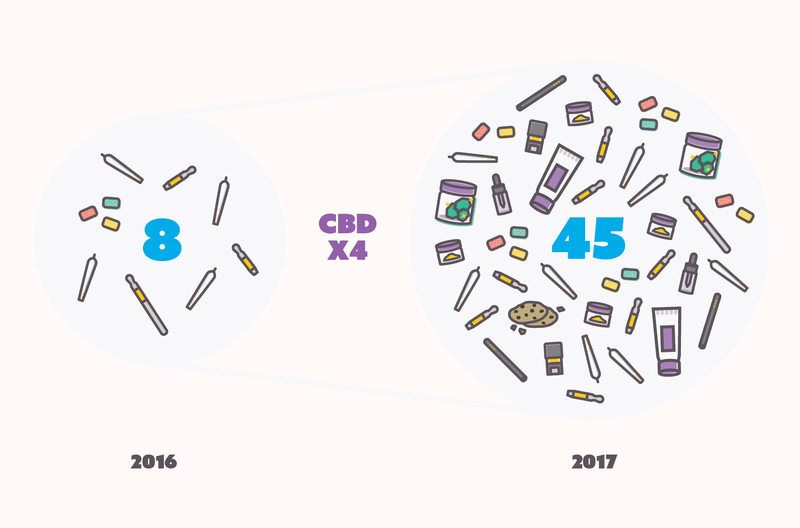 Our data shows that people are increasingly using marijuana as part of their daily routine, whether it's going out, staying in, or maintaining wellness. Read on to see how Golden Staters are reacting to the Green Rush. 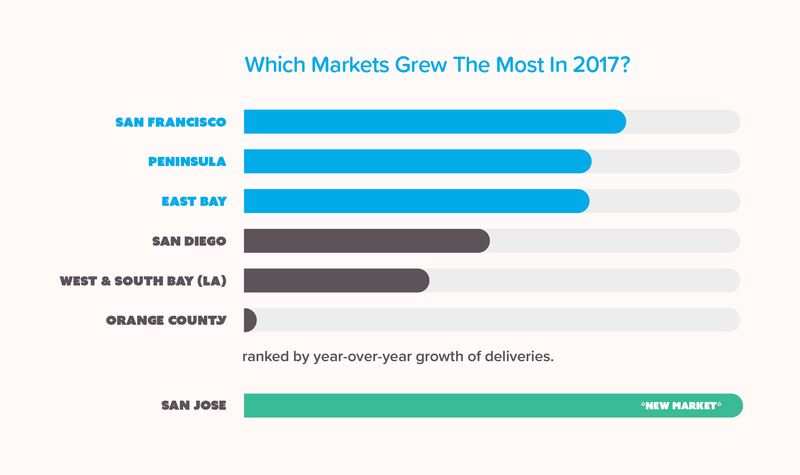 While every market had strong growth, San Francisco held onto the No. 1 spot for the third year in a row. This is likely due to the region's early adoption of medical marijuana and widespread acceptance. 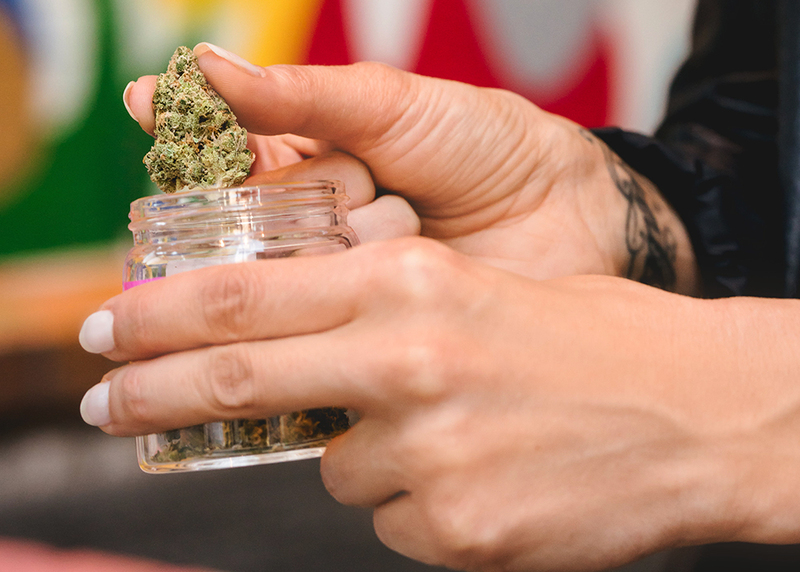 Close behind, however, are the Southern California markets that are expected to catch up as adult sales take root and as the public continues to integrate marijuana into their lifestyles. When Do People Buy Marijuana? 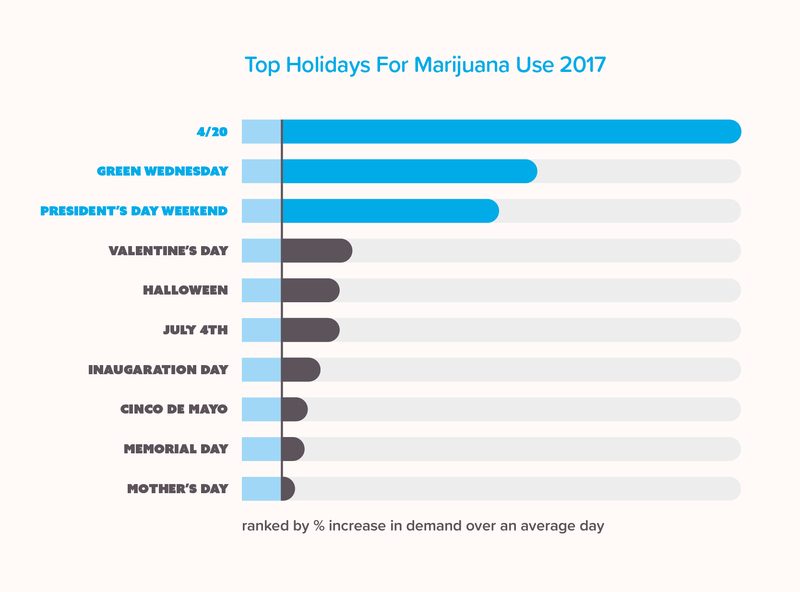 The past year saw an increase in marijuana use across all major holidays, but especially among those shared with loved ones like Valentine's Day and Fourth of July weekend, a sign of evolving times and attitudes towards marijuana. The two biggest and well-known marijuana holidays, 4/20 (April 20) and Green Wednesday (the day before Thanksgiving), continue to lead the pack. These numbers are all expected to grow as marijuana goes mainstream and many people celebrate 4/20 for the first time, as well as traditional holidays with marijuana. 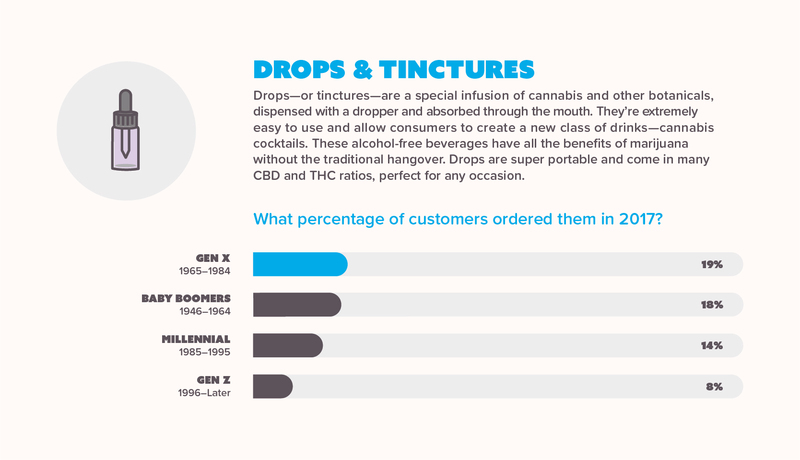 Today's cannabis consumers are incredibly diverse, and they need a variety of products to fit a wide range of lifestyles and wellness needs. Brands are meeting this demand with new products for the people, whether they are active, creative, or therapeutic. 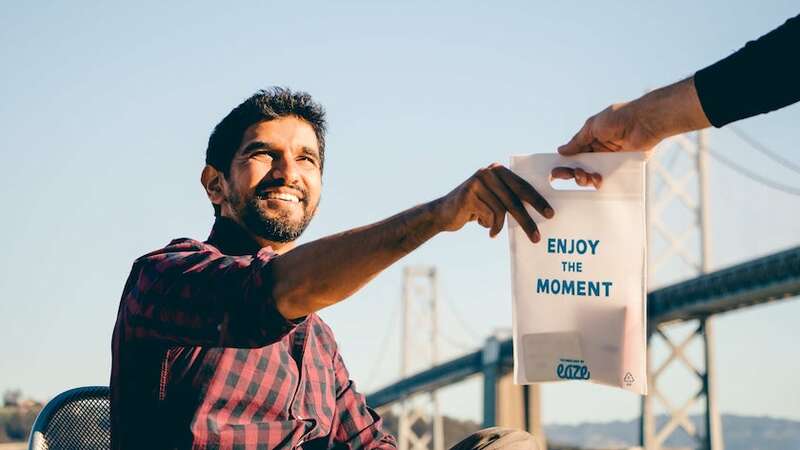 Eaze has worked to expand its selection to people as new products enter the market. And we've been steadily expanding our menu--since 2017 we've increased our number of brands by 239% and products by 323% in order to meet everyone's wellness needs. As cannabis enters the mainstream, people are discovering just how easy it is to enjoy marijuana. 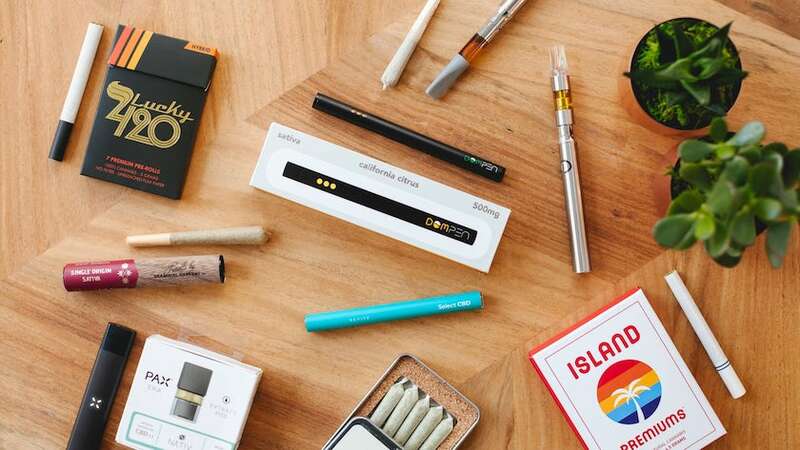 Products that are ready to use out of the box, easy to use, and portable, especially interest newcomers as these products result in a smooth and pleasant first-time introduction to marijuana. 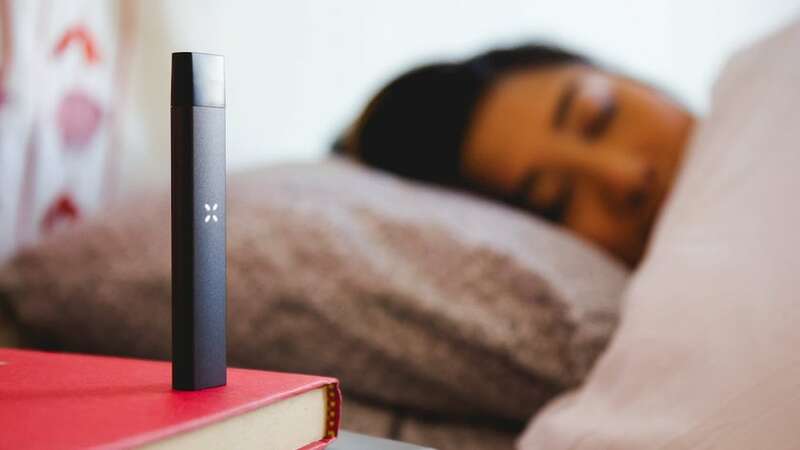 These "convenience" products only require a match or lighter, a push of a button, or some appetite, and are perfect for many lifestyle activities, such as prerolls for a concert, or a vaporizer for yoga. The No. 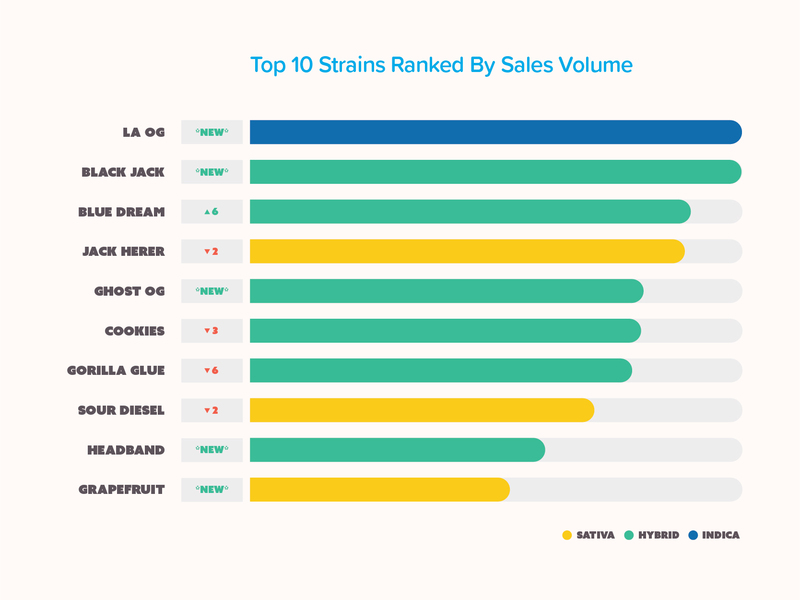 1 strain is new to this list--LA OG, a sweet and earthy smelling indica known for its relaxing effects. Last year's No. 1 strain, Gorilla Glue, tumbled six spots. Five new strains also appeared on the list as consumers branch out and explore new flavors, effects, and experiences. People are also experimenting with different strains for different activities. Hybrids are still preferred, which account for 60% of the list, followed by sativa (30%), and indica (10%). Most adults know that marijuana is beneficial, but not everyone knows that it's possible to get those benefits without the "high" feeling. CBD, or cannabidiol, is a compound found in marijuana that's non-psychoactive, extremely versatile, and highly sought after for its anti-inflammatory and healing properties. 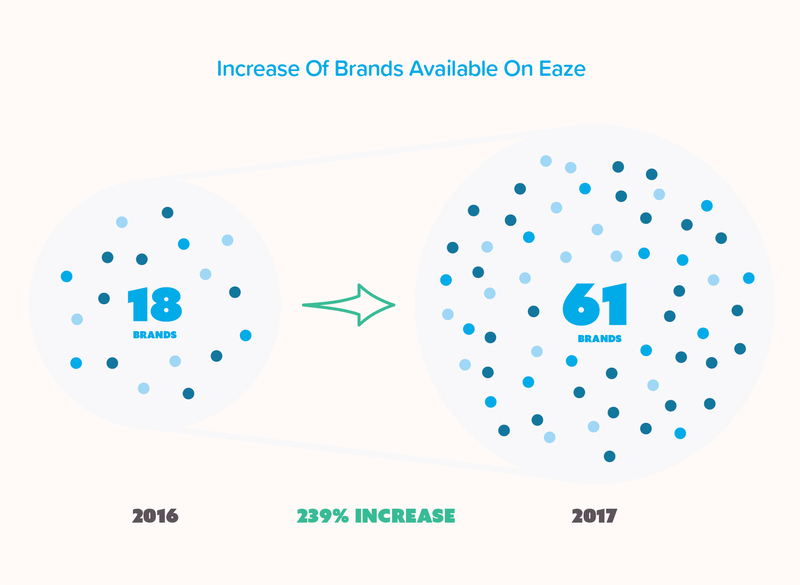 Because of the exceptionally high demand for CBD, Eaze has prepared for 2018 and has more than quadrupled the number of CBD products available for adults. 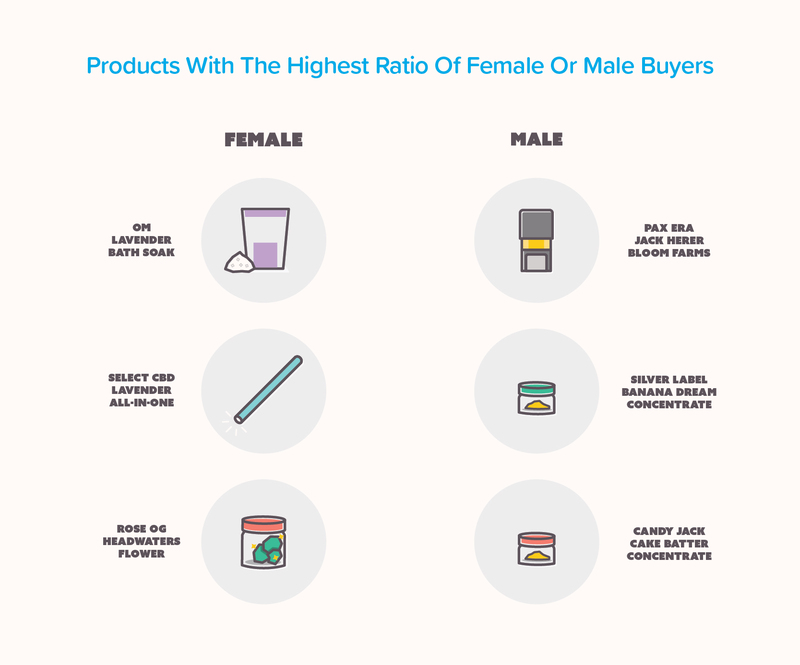 As record numbers of men and women discover marijuana, the data shows that each gender has a preference for what type of marijuana products to buy. Overall women are more diverse in their purchases, opting to buy different products that meet a variety of health and wellness needs. Men seem to prefer potent efficiency, as concentrated forms of cannabis were the most popular items for males. 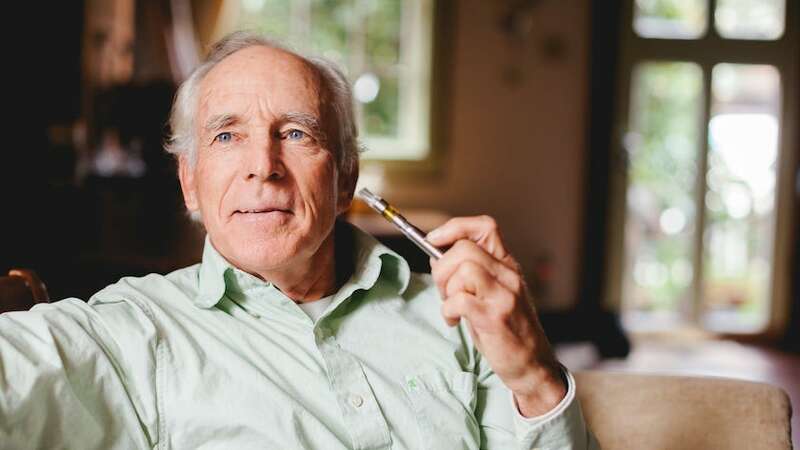 Adults of all ages are experiencing the benefits of marijuana and the numbers are growing. Many adults are turning to marijuana as a cleaner, healthier substitute to smoking or drinking. Consumers are also trying CBD products as a natural, non-pharmaceutical form of relief. As a result, demand is rising across all age groups. While women have always enjoyed the benefits of marijuana, the vast majority of marijuana buyers have traditionally been men. But improved access and safety, combined with an expanding menu of brands and products specifically for women, has enabled women today to easily get the products they want. 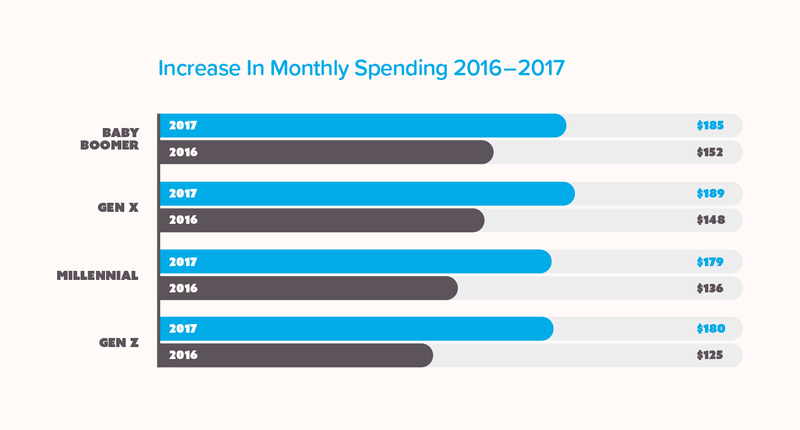 Women's monthly spending increased by 20% last year and continues to rise. The total percentage of orders from Baby Boomers increased 19% year-over-year-the largest growth among any generation on our platform. 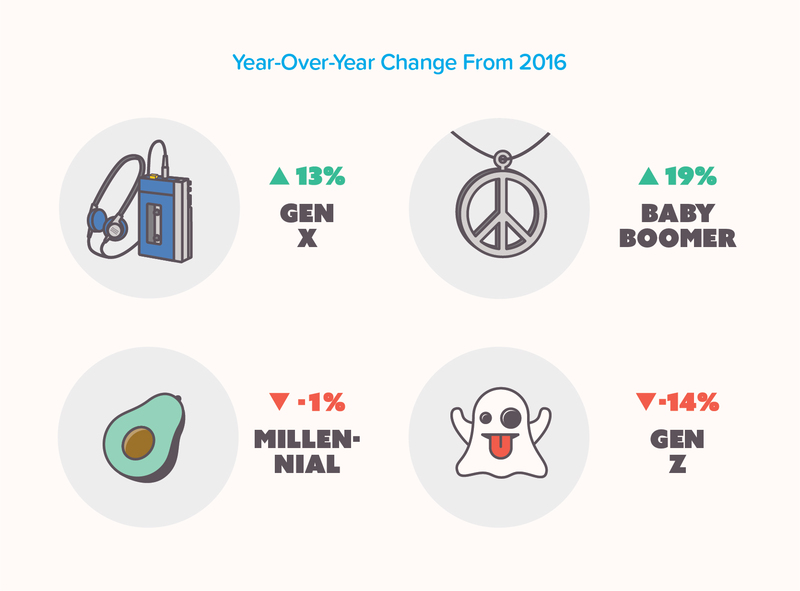 Followed closely by Gen X who increased by 13% year-over-year. This trend suggests that a significant portion of the industry's growth is due to people looking for wellness and therapeutic options. 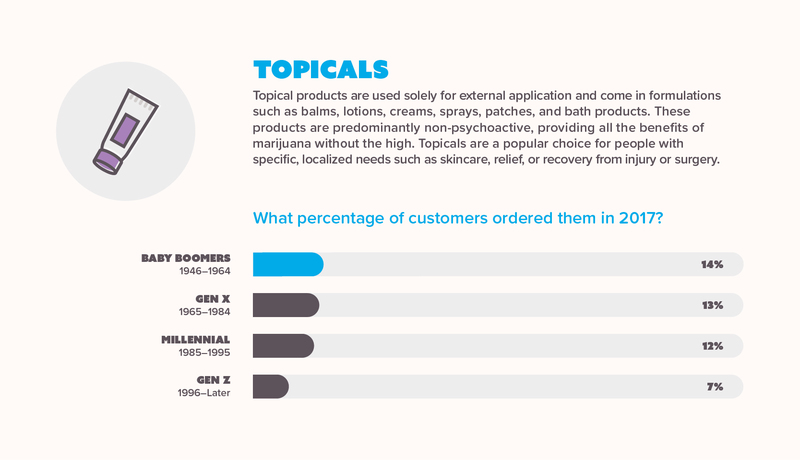 We've begun to see clear generational product preferences as adults discover new consumption methods. 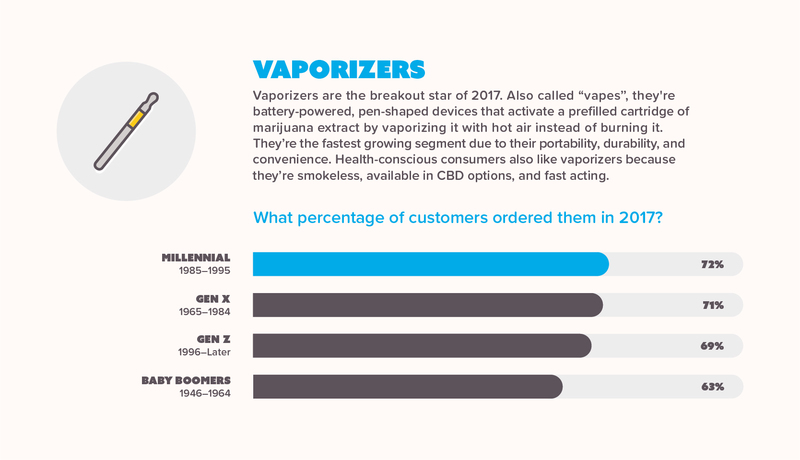 In 2017, baby boomers gravitated toward topicals while millennials preferred vaporizers - in fact our data shows that 72% of millennials purchased one in 2017. 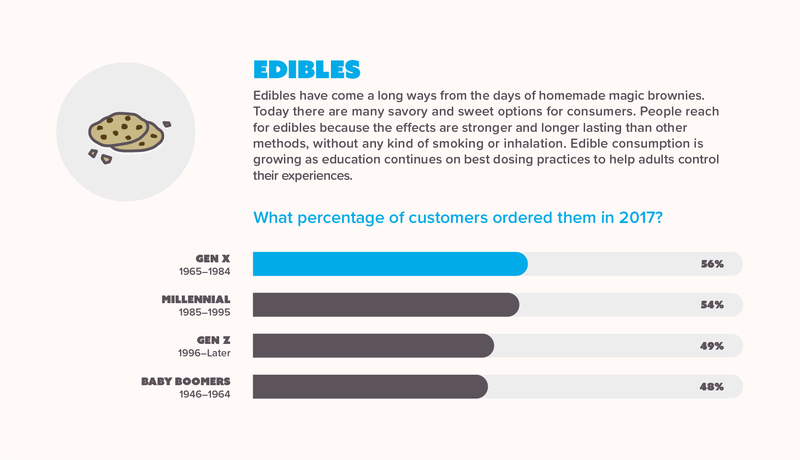 Gen Xers prefer edibles and drops the most, which suggest they prefer non-smoking options for consumption. Widespread acceptance is growing and people of all ages are no longer hesitant about trying marijuana. Annual spending per month is up for all generations as innovative Californians are taking up the benefits of marijuana into their lifestyle. Marijuana helps people sleep at night. People are reducing or replacing their sleeping pills with marijuana for different reasons such as cost-effectiveness or less drowsiness. 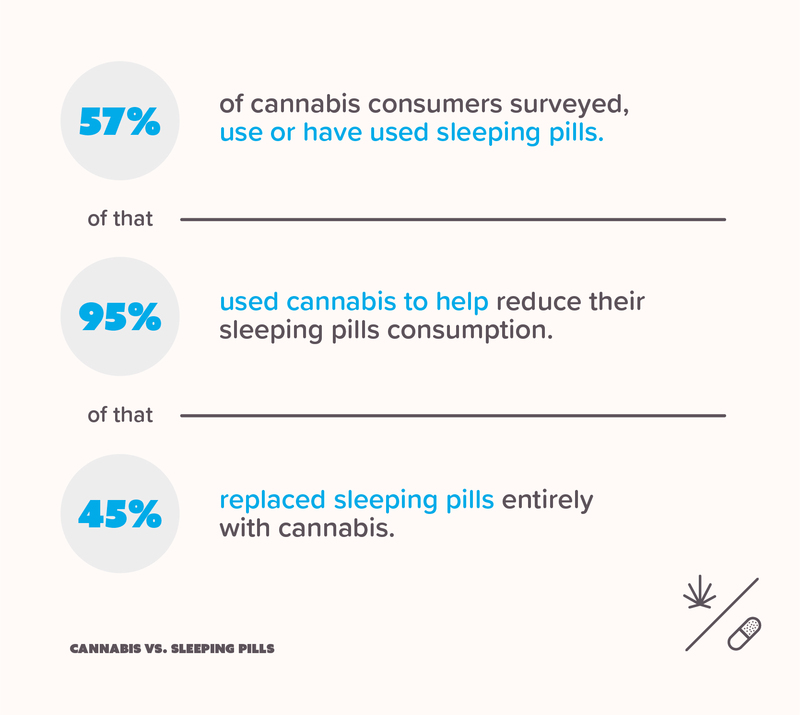 57% of consumers surveyed use or have used sleeping pills, and 95% of those people said that they used cannabis to help reduce their consumption of sleeping pills. 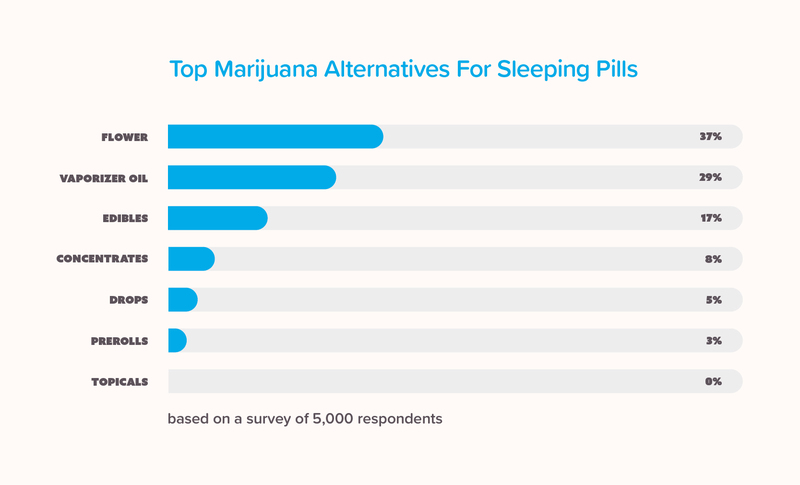 Of this 95%, almost half (45%) reported that they completely replaced their sleeping pills with cannabis. People prefer the natural properties of flowers and vaporizers instead of synthetic sleeping pills. 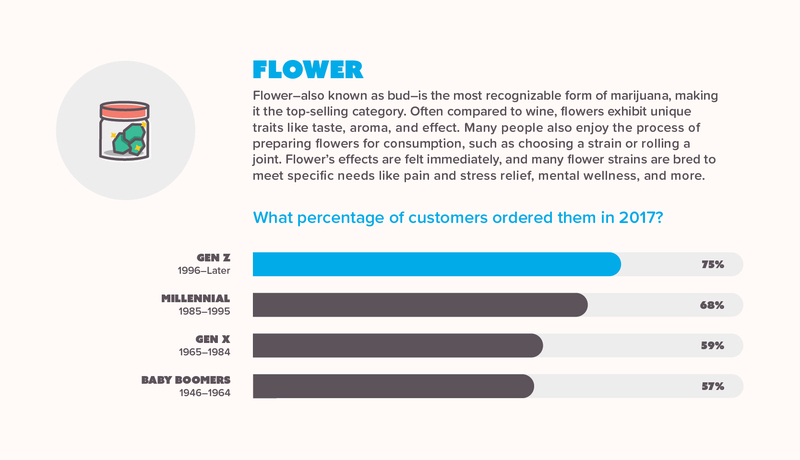 37% of respondents reported flowers as their primary substitute for sleeping pills, while 29% preferred vaporizers instead of sleeping pills. This is likely due to the fast delivery of THC of these methods, making it easier to fall asleep faster. 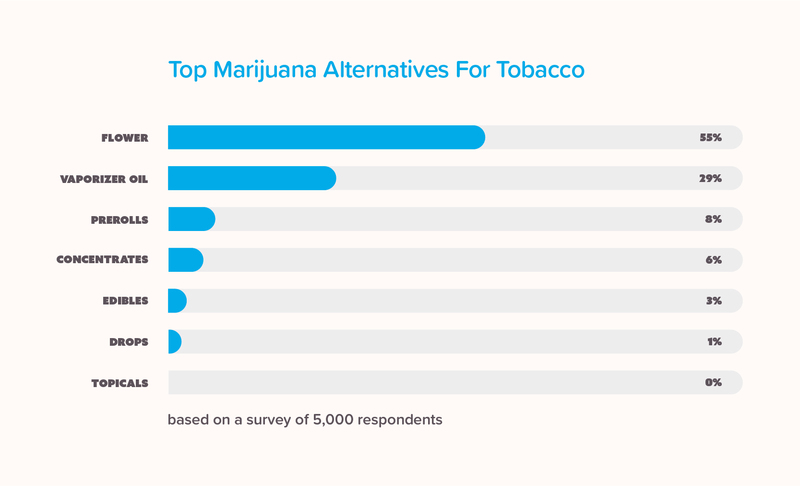 Nearly three quarters of tobacco users reduced their tobacco use with marijuana. The effects of THC last much longer than nicotine, the primary ingredient of tobacco. 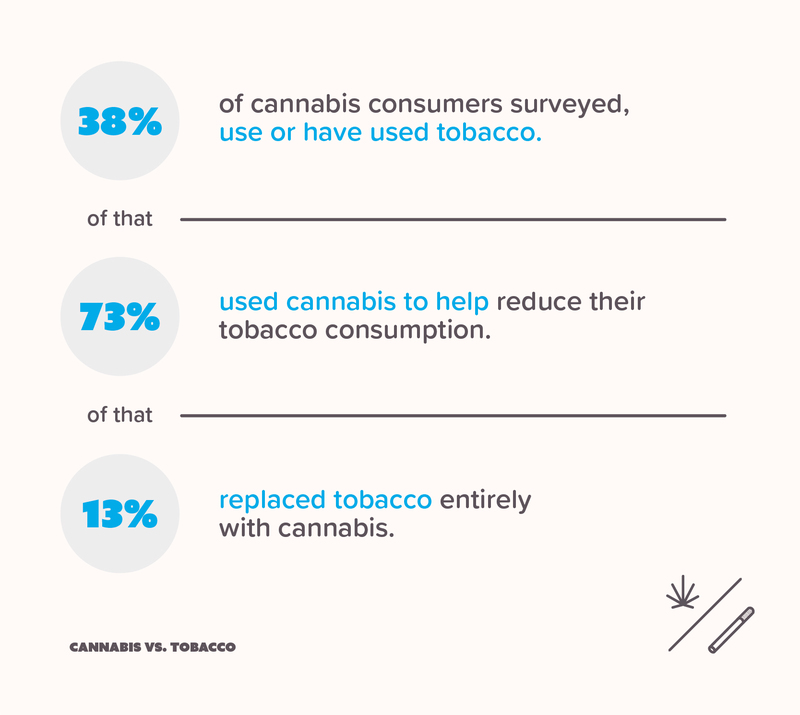 38% of respondents use or have used tobacco, and 73% of those reported that cannabis helped them reduce tobacco usage. Nearly 13% of these people completely replaced tobacco with cannabis. People who use tobacco prefer flowers and vaporizers for substituting tobacco. These marijuana products are flavorful and quickly provide effect. 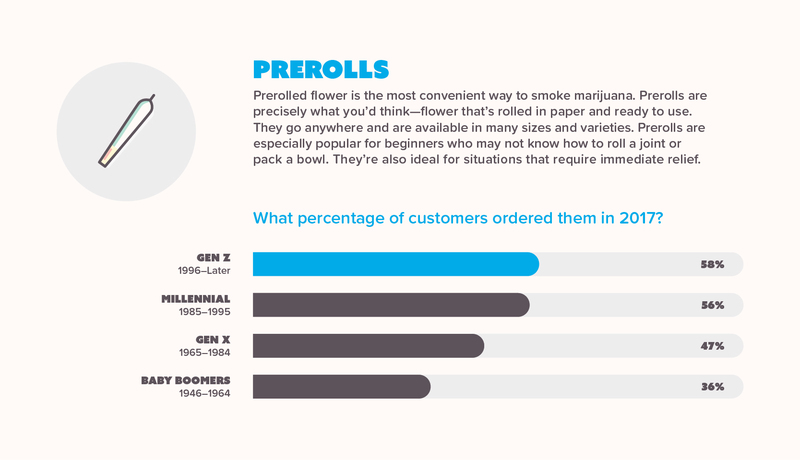 55% of respondents reported flowers as their primary substitute for tobacco, while 29% preferred vaporizers instead of tobacco. Both of these methods can help reduce tobacco usage by providing an experience similar to smoking. Marijuana can provide a natural alternative for people who use prescriptions for anxiety. In particular, indica strains of marijuana are reported to have soothing effects. 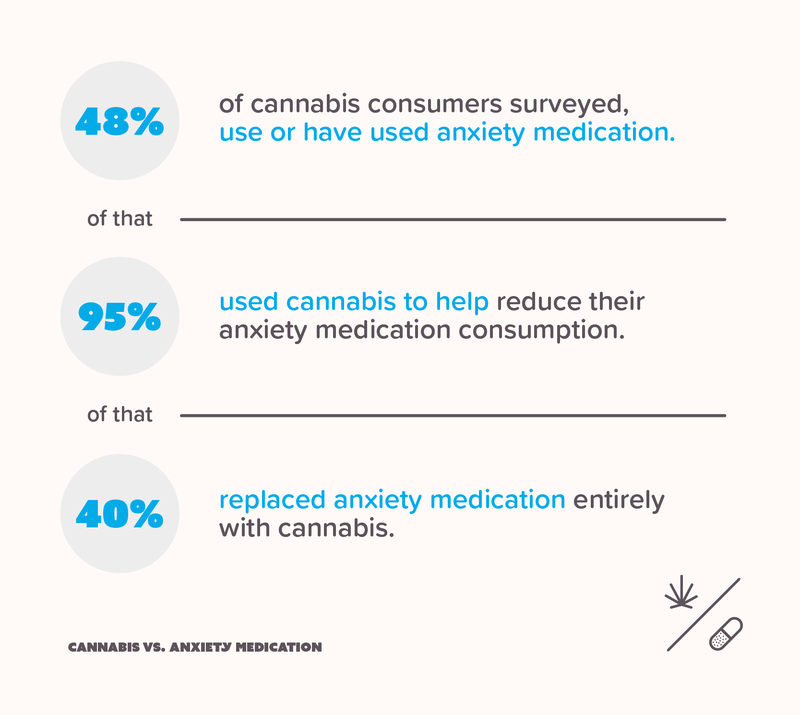 48% of respondents use or have used anxiety medication, and 95% of those reported that cannabis helped them reduce anxiety pills. While 40% of these people completely replaced anxiety pills with cannabis. People use marijuana to help manage their anxiety. People with anxiety tend to prefer fast-acting flowers and vaporizers as a substitute for anxiety pills. 37% of respondents reported flowers as their primary substitute for anxiety pills, while 29% preferred vaporizers instead of anxiety pills. This is probably due to the fast delivery of THC of these methods, making it easier relax and maintain mental wellness.